I find it interesting that Christianity found it’s way to Rome before Paul made it there. To me that is an encouraging sign that The Way, was spread through the known world at the time of Pentecost. Yet while this may be true, there is no biblical evidence to support this except to say that Aquila and Priscilla went home and spread their version, along with the fact that Christianity did make it to Rome before Paul got there. In any case the fact that the Good News of Jesus was spreading throughout the known world is something that is encouraging to hear. This post was extremely interesting to me. As Nathan mentioned above, Christianity was in Rome before Paul got there. I think that this is another example of how the book of Acts shows how God can move through different places. As I look back in some of the other chapters. I see a common trend. I also see how they could be quite different though. I will go back and use Ephesus as an example. Paul came into Ephesus and it was an extremely sinful city. One could even say that Christianity was not even heard of. There were magicians, sorcerers, and exorcists. This was Paul’s longest journey and after he left, Christianity was spread throughout the land. Many lives were transformed. I believe that it is reasons like this that Christianity reached different places before Paul did. As we know, Paul spread the Gospel by Word-of-Mouth and people were constantly traveling. So, this could have very well been the case. Ephesus and Rome aren’t neighboring towns, but I assume that people traveled from place to place with the ports and doing business. I think it is extremely important think about how often the Jews were in contact with the Romans. This goes back to what I have mentioned above though. The word is spread through people talking with each other. Personally, I can’t think of another way that it would have been spread to Rome before Paul. If I were in Paul’s shoes it would be extremely encouraging to me. it would seem that Paul was taking a gamble when he decided to set things in motion that would lead him to Rome. no matter if Christianity had made it to Rome before Paul or not he was still stepping into the unknown. if the Jews there had heard of him he could be under attack from them the moment that he arrived and that would still be true even with Jewish Christians. it would seem that Christians were very Jewish in Rome as we have Pricilla and Aquilla as examples. but it is interesting that this did not bother Paul not knowing he clearly had faith and that faith was clearly rewarded. it was rewarded because when he arrived he was not attacked and in fact the Jews in Rome had not heard things about him already and they actually listened to him at least for a time. Paul could have worried he could have been unsure and allowed that to hinder him or pull him off course but he trusted in God that the plan that God had would be fulfilled one way or another. When Paul reaches Rome it is clear that Christianity was already found in the city. This is really cool to me because from the book of Acts we get to read specifically on Paul’s journey and testimony to all the good works that he did for the different cities through out his journey. This makes me think of how many people God has used to spread the Word to those who don’t know it. I think this article was very interesting and encouraging to see how God works through all of us and uses us to spread the Word. I am excited to graduate and see what God has in for me in the future and how I can be used to be the light for others just like Paul was in the book of Acts. 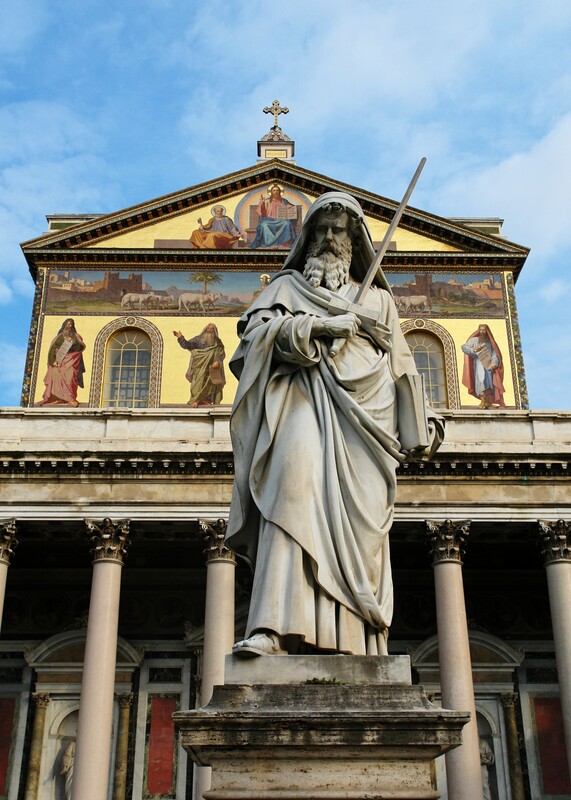 Paul was not the first person to share the gospel message in Rome. Yet, Paul travels throughout his journeys to encourage and build up the community of believers. Paul continues to share with Gentiles and Jews about Christ and the model of peace, love, and grace found in God. The article focuses on the idea that it is by grace we are saved not by works for we could never earn salvation on our own. Works are just a way to show our appreciation that we didn’t deserve yet is given freely. We too should not expect to be given anything for our works rather we do it for God out of joy and desire to.